If Amy Winehouse, Nas and Adele were asked who we should watch out for in 2009, one name they would all agree on is 27 year old singer songwriter Daniel Merriweather. Back in 2001 a then little known producer called Mark Ronson was looking for someone to vocal on the debut album release of Nikka Costa. He wanted someone who sounded unique, with influences as diverse as his own. He eventually found the man for the job, not in New York or Atlanta or London, but in a trailer at the end of a train line on the eastern outskirts of Melbourne, Australia. Daniel Merriweather, who had only released one track in his home country at that point, captured Mark's ear and imagination like no other aspiring singer he had heard before, and was immediately flown over to New York to meet him. The creative bond between Ronson and Merriweather was instant. What followed was not only the birth of a unique working partnership but also a great friendship. Merriweather went on to vocal two tracks on Mark's debut album Here Comes the Fuzz and after a couple painstaking years of commuting to and fro from Australia, Mark and partner Rich Kleinman signed Daniel to their then embryonic label Allido Records and moved him over to the Big Apple. By 2007, Merriweather's emotive voice became firmly ensconced on public consciousness when he sung on Stop Me, the lead single of Mark Ronson's second album, Version. 2008 marks yet another likely smash hit under Daniel's belt, with the December release of Wiley's follow up to My Rolex, Cash In My Pocket, which Daniel not only sings on, but also wrote. 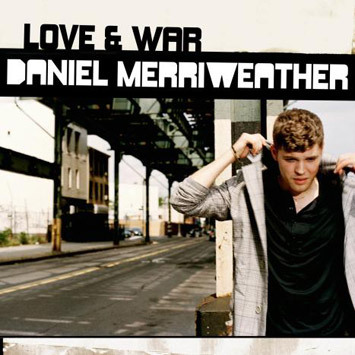 Daniel Merriweather is, nonetheless, anything but a set of rent-a-pipe, and his forthcoming debut album, Love & War, will rapidly tear up any pre-conceived ideas of what or who he is, as will five minutes in his company. He has a wolverine like tenacity and possesses a sense of humour and self awareness, articulateness and worldliness that belies his tender years. In Love & War, Daniel has shaped a record informed by the juxtaposition of the cultural metropolises that he has lived between (New York and Melbourne), which is both complicated and equally carefree without ever being schizophrenic. Here shiny pop production and the temptation to make a slick and smooth contemporary neo-soul record have been wavered in favour of space, stark emotional intimacy, sonic expansion and crackling introspection. The results are extraordinary; an anthemic psyched out acoustic folk record fuelled by the fires of Motown & Stax, with a heart the size of Alaska. It is every bit the classic debut one would have hoped for and more, filled from start to finish with thrilling hit singles to boot, and is a long long way from busking on a street corner in Melbourne, just to earn a buck. Love & War is available from April 2009. The first single to be released from the album will be Change, featuring fellow Allido artist, Wale.